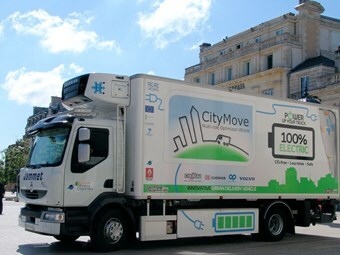 For the past three years, Renault Trucks and Chereau have been involved with the Citymove European research programme to develop an experimental vehicle with the goal of lowering C02 emissions. What Renault came up with is a fully-electric Midlum, a 16 t GVW (Gross Vehicle Weight) truck with a payload of 5 t and a refrigerated body. The truck has an operating range of approximately 100km, with zero on-road C02 emissions and <60dB of noise, all thanks to a Lithium-Ion battery and a 103 kW electric motor. The truck also has a "Birdview" system, which uses various cameras fitted on the outside of the truck to display an image of the immediate surroundings to a driver. Renault claims that this system makes it possible to "reduce the risks associated with blind spots and help drivers when they are manoeuvring." The first stage of the Citymove European research programme aimed to involve suppliers, administrative authorities and consultants in the discussion as to how to create an environmentally-sound transport solution. The second stage of the programme is the actual construction of the vehicle. In order to test the vehicle, Renault is partnering with the France-based Transport Jammet, who specialise in refrigerated trucks. Right now, the test is being conducted in Poitiers, France, in order to "enable local elected representatives, shop holders and the town population to share in this test program and react to it," according to a Renault media release. In contrast, Smith-Electric presented the Newton at the Brisbane Truck Show, another 100 per cent electric vehicle, this one with a range of up to 240km and a GVW of 7.5T. Renault Trucks also recently experimented with a Hybrid Midlum, which has an operating range of 400km. Click here to search for new Renault van specs.